The historic hamburger, now modernized, is a product of the culinary needs of a society rapidly changing due to industrialization and therefore having less time to prepare and consume meals; as assumed by Wikipedia. 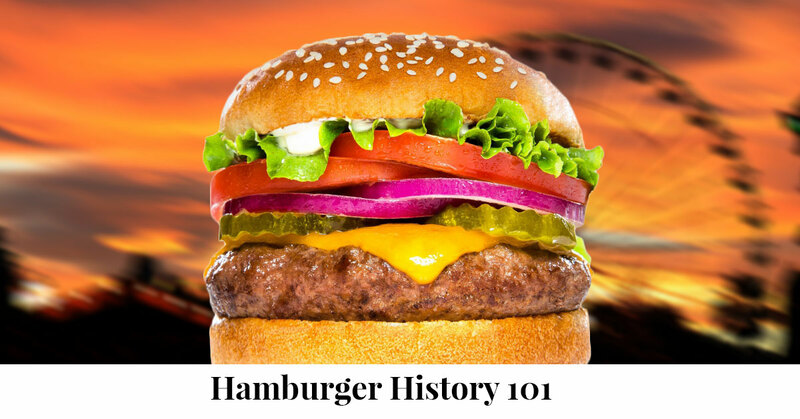 Back in the 19th or early 20th century, the hamburger first made its appearance. At first, the hamburger was created with a decadent portion of steak made of solid ground beef slapped between two slices of white bread. When the hamburger first started being consumed, many were appalled because for years they were eating these foods as two separate entities before their combination. Shortly after the creation of the hamburger, consumers started adding typical, and some non-typical, trimmings to their burger, including sliced pickles, onions, lettuce, mustard and ketchup. Where is the origin of the delectable hamburger? Unfortunately, there’s no correct answer to this question. In fact, the origin of the hamburger is so controversial we may never learn for certain which country, or state, first created the historic hamburger; however, there are conspiracies in which you may choose to take part. Some say, mostly Texans, the very first sighting of the popular American food, the hamburger, was in Texas. Why? In a small town in Texas, there was a restaurant named “White Castle.” This restaurant is known and has been known since they first opened their doors, for their hamburgers. This fast-food restaurant still exists today and takes credit as the founder of the hamburger sandwich; however, records from this period in time are a bit scarce. Two brothers in Akron, Ohio have also claimed they are the two who started the beginning of this American food trend, the hamburger. They stated that it was their idea and they were the first to sell the hamburger at their very own county fair, the Erie County Fair. However, this statement does not have much to back it up, therefore there are not many followers on the belief that the hamburger was first created and sold in Ohio. When was the popular American food, the hamburger, created? Just like the origin of the hamburger, the date of its creation is also unknown but that doesn’t mean claims haven’t been made. There have been notations made for the invention of the hamburger between 1885 and 1904. It’s easy to believe that the hamburger was created during these two centuries, however, there is no real proof of that happening. You may be wondering why so many people wouldn’t point towards these dates, and it’s because during this time major events took place, such as conferences, festivals, fairs and amusement parks. According to Wikipedia, these hypotheses also share the presence of street vendors. The mystery of the invention of the hamburger may live on forever, just like your love for the popular American dish. If you’d like to learn more about the types of hamburgers available at our American food restaurant in Lake Park, feel free to stop by for lunch or dinner. We have many different burgers for you to try. Let us be part of your hamburger-tasting history; come on by today! © 2016 Marketing 360® -All rights reserved.